Home /◄ Know a Child in Need? Do you know a child who is struggling? Contacting Mercy Home could save a life. Mercy Home’s residency program is for youth between the ages of 11 and 21 who live in situations that place extra stresses on their health and progress. The common thread that connects our children to Mercy Home is that they have experienced trauma and that they are committed to changing their lives. We welcome referrals of young people in need from throughout the Chicago area. 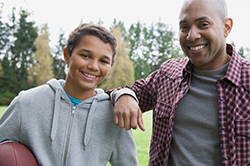 We evaluate each referred youth for appropriate placement within our full-time residential programs. Our admissions process is designed to ensure that each youth who comes to live at our Home is best served by the resources we provide. If you are a young person or would like to refer someone in the Chicago metropolitan area complete our referral form and one of our trained admissions counselors will contact you.